Nicéphore Niépce invented the concept in 1826, but it was Louis Daguerre who turned it into a process in 1839 and photography was soon on its way to the Alpine summits. The first photographers had to demonstrate technical, artistic and… athletic capabilities, but their successors found the going easier due to technical progress and a breaking away from Alpine stereotypes. The incredible discovery, in 2007, of the oldest photo lab in the world sheds new light on the first photographic techniques. Around 1850, Fortuné-Joseph Petiot-Groffier experimented the new techniques that were rapidly being invented. The discovery is a unique chance to take a new look at the pioneers and their alchemy with light. Paper from Rives was a must for photographers over decades. The dynamic company in the Fure valley north of Grenoble met with striking success by innovating in the middle of the 1800s in high-quality photographic paper. A driving force in the new technology, Rives convinced George Eastman and earned a share of the world market. The Bisson brothers, forerunners in mountain photography, found an accomplice in writer Théophile Gautier. At the start of the 1860s, Gautier reinvented Alpine literature, inspired by their images of Mont Blanc whose spectacular realism spelled the end of overly picturesque painting. Thanks to the autochrome, invented in 1907 by the Lumière brothers, colour photography went industrial. This complex process, based on potato starch, timidly penetrated the Alps with a few knowing amateurs. In the beginning of the 1930s, film put an end to the autochrome, but… retreated to black and white. A jeweller captured lifestyles in the lower Isère valley in the beginning of the 1900s. The 750 glass-plate photos take by Alfred Vourey constitute a portrait of a rural population from 1900 to 1936 and reveal the increasing presence of photography in local life. The collection may be seen at the Grand Séchoir in Vinay. The Alps. 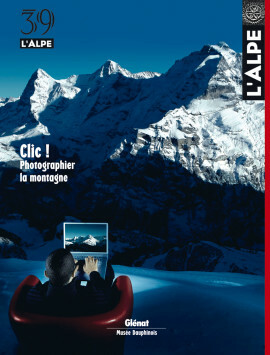 What remains to be done, photographically speaking, in the Alps, after so many years of stereotypes ? That was the question for this special issue. The result exceeded all our hopes. Despite all the weary clichés, there are still photographers and writers with the desire to take a new look at such an outstanding environment, at the human and natural landscapes, even the most common. A demonstration. Alpa, the outstanding brand, symbolises Swiss high technology. That is why the various models produced by the company are prominent in the impressive collection of the Photographic museum in Vevey, dedicated to both technical and artistic creation. What lies hidden in a photograph ? Examined attentively, three old images and one new reveal the secret links between the author and the viewer, just waiting to be discovered. In an infinite game of mirrors. All identical, yet each unique, old marriage photographs reveal a thousand social details. Taken by an amateur photographer in the Vercors in the beginning of the 1900s, a major part of the images, both solemn and moving, underwent anthropological study that stirred buried memories and family histories. If we, amateur and professional photographers alike, are not careful, the total numerisation of images could well make inaccessible in the future the millions of photos taken today. Over 300 years old and always on time like a Swiss watch, the Messager boiteux is an almanac published every fall in Vevey. Considered essential by many Swiss families, it offers a pot-pourri of information and bases its predictions on both lessons from the past and good common sense. Grenoble, nestled among the mountains, has drawn engravers and painters since the 1500s. Over time, the many works, fascinating in their variety, have portrayed the transformations and day to day life of the city. A remarkable journey through a changing urban and pictorial landscape to be seen at the Musée de l’Ancien Évêché.